A PLYMOUTH man is hoping to go from being a self-confessed ‘couch potato’ to a marathon runner in just over six months. Alan Meyrick was persuaded to do the Plymouth 10k earlier this month by a friend, who wanted to run for St Luke’s Hospice. Alan has since caught the running bug and completed last Sunday’s Tavy 7 and is now entered for the Bath Half Marathon and the London Marathon, where he will be raising money for the Action on Pre-eclampsia (APEC) charity. The 31-year-old wanted to run for that particular cause as his wife nearly died from Hellp syndrome in 2011 after giving birth to their first child. “I got persuaded to do the Plymouth 10k by a friend and we ran that for St Luke’s,” said Alan. “But I wanted to continue to get a bit fitter and lose some weight. “My wife said ‘why don’t you do something for APEC in the future? I said to her may be next year, meaning 2018, but I was laid in bed and I thought if I don’t do it now I will probably never actually do it. Alan knows he has a lot of training to do between now and April, but so far it is going okay. “I am enjoying it,” he said. “I’m going out running a far old bit. I have got a bit of a dodgy toe at the moment which is annoying, but when I was doing the training for the Plymouth 10k and Tavy 7 I did really enjoy it. He added: “I used to play football locally for quite a few years and a bit of badminton and things like that. But I got injured and hadn’t done anything for a couple of years. After doing the Tavy 7, Alan is planning on doing a number of other races in the build up to London. “It gives me something to aim for,” he said. “My biggest fear is I that will chill out and think I can catch up next week, but that then becomes the week after and the week after. 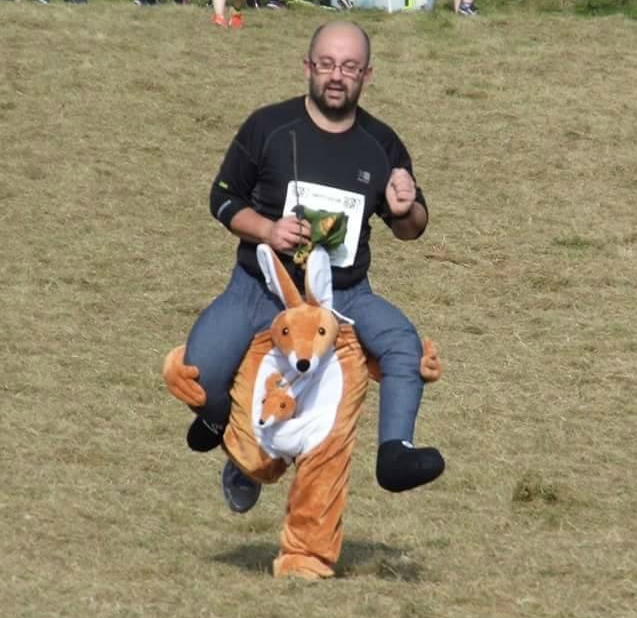 Alan ran the Tavy 7 in a kangaroo outfit to try and raise the profile of his cause, but he says he won’t be running in that costume again. “It was extremely painful to run in,” he admitted. “I shall not be doing it again in a hurry.